The Andrew W. Mellon Foundation has announced a major gift of $1.25 million to Buffalo State’s Art Conservation Department to bolster graduate student fellowships in the flagship program. To meet the challenge, Buffalo State is charged with raising $750,000 by June 2017. The resulting $2 million fund will ensure continuous support for students who enter the extremely rigorous and competitive program, one of only four such programs in the country. The Mellon challenge grant follows numerous other awards from the New York-based foundation over the past three decades, all of which have enabled the art conservation program to be a leader in the field of conservation of fine art, cultural heritage, and historic works. "The Andrew W. Mellon Foundation has truly enhanced this department, and we greatly appreciate the long-lasting support and encouragement that has been afforded us," said Patrick Ravines, director of art conservation. "Because of the Mellon Foundation’s deep generosity, the fields of conservation and art history have benefited and grown by providing well-educated and trained conservators to preserve fine art, cultural heritage, and historic works as well as having provided leaders to take the field into the future." Buffalo State’s distinguished program educates conservators of fine arts and material cultural heritage, including paintings, art on paper, historical objects, photographs, textiles, ceramics, and library and archives collections inclusive of rare books, manuscripts, and maps. Art Conservation Department alumni are employed by major institutions across the country including the National Gallery of Art and the Smithsonian Institution in Washington, D.C.; and the Brooklyn Museum, the Metropolitan Museum of Art, and the Museum of Modern Art in New York. 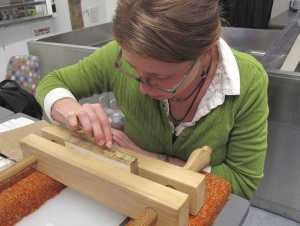 Professional conservators are an integral part of the work of museums, libraries, and archives as they diligently continue the important work of preserving the past. Some of the most accomplished professionals in the field are educated at Buffalo State, where the Mellon Foundation has played a decisive role in the program’s continued strength and success. Since 1969, the Mellon Foundation has provided substantial financial support to the arts and humanities in four program areas: higher education and scholarship; scholarly communication and information technology; art history, conservation and museums; and the performing arts. In its ongoing support of the humanities, the foundation has awarded $1.1 billion to American colleges from 2000 to 2012.